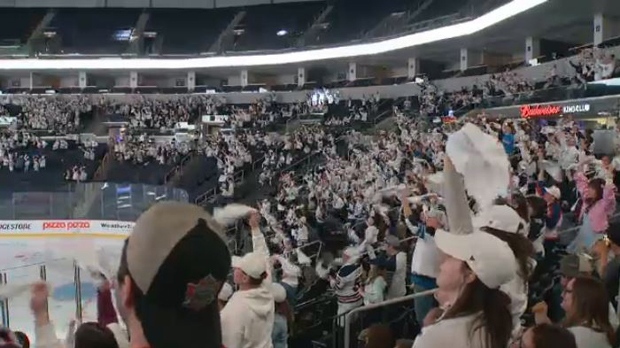 With the Jets on the road for game three against the St. Louis Blues, the Winnipeg Whiteout was still alive and well at Bell MTS Place Sunday. True North Sports + Entertainment (TSNE) hosted a viewing party for Sunday’s game and will be doing so for every away game during the playoffs. Thousands of Jets fans piled into the arena sporting white, some with painted faces and Jets coloured masks, to support their team. TNSE says over 4,000 fans were in attendance Sunday to watch the Jets and Blues. As of Sunday afternoon just under 4,000 tickets had already been sold for the viewing party, said TNSE. Fans were also able to buy tickets at the door. Tickets to the viewing party are $10 and all fans received a ‘We are Winnipeg’ rally towel. Proceeds from viewing party tickets will benefit the True North Youth Foundation.